Many of us have repeated the assertion that writing paper in early modern England was expensive and scarce, but it has always bothered me. After hearing this fairly regularly in response to two common questions —“Why did people write on the endleaves of printed books?” and “Why are there no ‘Shakespeare manuscripts’?”—I started keeping track of paper prices in account books and bills and receipts to see if this was actually true. I was suspicious because a considerable number of early modern manuscript books at the Folger and elsewhere are mostly blank. The majority of leaves in this manuscript cookbook (Folger MS V.a.401) from the 1690s are blank. A screenshot from a Luna advanced search on “blank” and “L.b. *” led me to Folger MS L.b.42 from the 1550s. The majority of letters from this period are written on the first page of a four page bifolium, with the inner two pages left blank and the last page used to write the superscription (the address). An etiquette manual published in 1675 encourages the ostentatious display of blank paper as a show of respect, its writer suggesting that when composing a letter, to “make use of large Paper rather than small, and a whole sheet (though we write but six lines in the first Page) rather than half a one, is no inconsiderable piece of ceremony, one shewing reverence and esteem, the other familiarity or indifference” (Antoine de Courtin, The Rules of Civility). However, even drafts of letters are often written on whole sheets, suggesting that leaving blank paper unused was hardly considered decadent and not only meant to impress. Nathaniel Bacon used a whole sheet, folded into a bifolium, to create this rough draft of a letter to Lord Ellesmere, even though he only needed a single leaf (Folger MS L.d.122). We have a lot of blank pages in our vault. 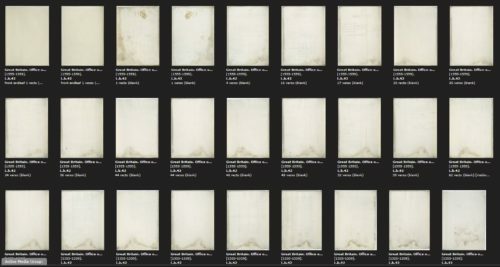 In fact, we have so many blank leaves in the manuscript collection that to avoid mutiny in our Photography and Digital Imaging department (the word “soul-killing” was mentioned multiple times in our discussions), we developed a placeholder image that they use when there are just too many blank pages in a row to justify the time and effort. We still felt it was important to represent their existence so that users would understand the extent to which the pages with writing on them were surrounded by pages with absolutely nothing. Plus, these placeholders can be exchanged with the actual images if and when emerging research questions warrant it. 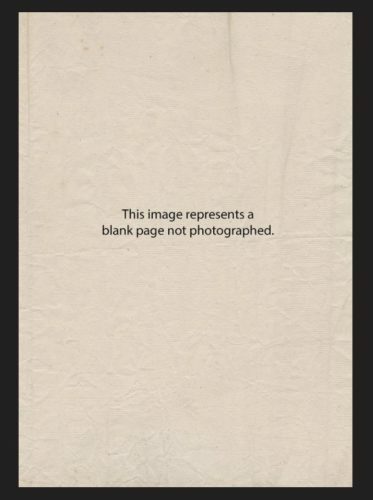 We have so many blank leaves in the manuscript collection that we had to come up with a placeholder image with the caption “This image represents a blank page not photographed” in order to record long stretches of blankness without blanking the souls and minds of our Photography and Digital Imaging colleagues. The three examples below, from the papers of the Bacon-Townshend family, are typical of the references to paper prices found in bills, receipts, and accounts. You can click on each image to go to the full images in Luna. “Paid for ij queires of paper —– viijd” [Paid for 2 quires of paper: 8 pence]. Detail from Folger L.d.960, Jane Townshend’s account of payments for teachers and teaching supplies, ca. 1590. “A queire of paper —– iiijd“. Detail from Folger MS L.d.947, ca. 1590. “Item for ij Quars of papere —– viijd“. Detail from Folger MS L.d.679, 1577. To put this in perspective, the average laborer making 6-12 pence a day could purchase up to 75 sheets of paper with a day’s wages. Put another way, if we accept D.C. Coleman’s estimate that the average annual consumption of white paper per head in England in 1600 was 6 sheets (p. 15), that’s a penny per year spent on paper. These numbers are all slightly wobbly, of course, but they suggest that regular writing paper was not an expensive consumable for laborers or aristocrats. Also, the price of paper barely budged between the 1570s and 1640s, while the price index for most other consumables (foods, candles, oil, textiles) increased by 63%.2 Royal, imperial, fine, very fine, Venice, and other sizes and qualities of paper were considerably more expensive, but most people weren’t using fancy paper. I assume that the argument about paper being so expensive has been recycled from the print world. Plenty of work has been done on the economics of the printing house, and indeed, printing paper was an expensive commodity for publishers, printers, or authors, usually constituting nearly half of the production cost for a book. It required a sizeable upfront investment in cash, loans, or rags, thus tying up capital. I would argue that it was the scale of paper required to print the books that makes paper an expensive resource. Publishers bought many reams of paper (480-500 sheets of paper) at a time, while individuals usually purchased single quires of paper (25 sheets). See v. 4, p. 606 and v. 5, p. 607. See Henry Phelps Brown and Sheila Hopkins, “Seven centuries of the Prices of Consumables compared with Builders’ wage rates,” Economica, Nov. 1956, pp. 303, 312. I originally presented this research at the Renaissance Society of America annual meeting in 2012, and have been returning to bits and pieces of it ever since. Excellent, Heather, I think your thoughts about early modern writing paper not being an expensive commodity. Good to have them in writing. In authorizing the digitizers to show a placeholder image “when there are just too many blank pages in a row to justify the time and effort” to reproduce the blanks, how did you deal with the matter of the paper CHANGING in the sequence of blanks? Isn’t the occurrence of different paper significant? Can the digitizing operators be replied on to detect changes of paper in the sequence of blanks and to alert the viewer? Of course this thought raises the fundamental matter of alerting the viewer to changes of paper in any sequence of leaves, blank or written on. Hi Donald, Yes, the occurrence of different paper is absolutely significant, and that’s why we’ve created placeholder images–to reserve the unique sequence number for a later date. If we are going to show long sequences of blanks then we want to make them as useful as possible, which means, perhaps, photographing them differently than we would textual evidence (for example, using transmitted light so that watermarks and chainlines and imperfections are easily visible). This would require different techniques and workflows. 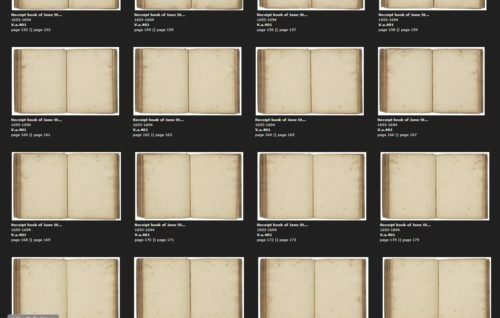 The placeholder images are not meant to be surrogates, but to help researchers identify manuscripts that might need further investigation as physical artifacts because of their extensive blankness. If at some point we determine that a particular range of blank paper is of significant research interest, we can digitize it and replace the placeholder images, while maintaining the same sequence number as before. Thanks so much for this invaluable (ahem) research, which answers a lot of questions I have been asking for some time. Thank you for this. I have been arguing the same thing for years and it is very nice to have some further evidence and to find another person on this side of the question. I wonder if you could address the question of qualities of paper as well as the more general question of whether paper should be regarded as “cheap” or “expensive.” How much more expensive was the Crowne paper used in the folio compared to cheaper cuts? Hi Roger, Please remember that I’m only talking about writing paper purchased in small quantities in this post, and not printing paper purchased in bulk. In the data I collected, prices ranged between 3 pence per quire to 48 pence per quire (for Imperial paper), with most of the finer paper ranging between 6 and 25 pence per quire, including Troyes, Frankfurt, Venice, Royal, White, Gilt, Demy, and Best. Consumers didn’t always use standard names for describing paper types. They used different types, sizes, and qualities of paper for different purposes, and the type of paper one used could reflect one’s social status or aspirations. Thanks Heather, very interesting. One question though. Unless I got this completely wrong, you indicate a day’s wage of a laborer would buy you 75 sheets of paper. Seems expensive, no? Today, taking a minimum wage of $10/hour and a workday of 8 hours means 75 sheets of paper would cost me $80. What am I missing? Hi Ian, Perhaps the fact that a laborer could buy 75 sheets of writing paper with a day’s wages isn’t a particularly useful comparison point, since, as I say in the next sentence, a laborer wouldn’t actually do this. More likely, he would spend just a penny a year on paper, with the rest of his wages being spent on more essential consumables. Also, I’m not sure we can directly correlate what seemed expensive then to what seems expensive to us now, in relation to daily wages. It may well be that a large-format Folio volume used better quality paper than “most Bibles.” Prynne’s comment was a complaint against all plays in print but appeared to focus on the quality of folio volumes rather than the cheaper quartos. Was the paper quality of Shakespeare’s folio any different than Ben Jonson’s Works of 1616? Are the many early modern Bibles in the Folger collection printed on substantially lower grade paper than the Folio? Hi Philip, Actually, John Spilman was making paper for printing and writing in Dartford, Kent, during Shakespeare’s lifetime and after, but not in large enough quantities to make it a reliable source for printing houses. Almost all of the paper came from northern France, but paper was also being imported from Italy, Switzerland, Burgundy, and elsewhere. Large copies of Jonson’s Works, like Shakespeare’s Folio, were printed on crown. For a great discussion of crown paper, see Carter Hailey, “The Best Crowne Paper,” in Foliomania! Stories behind Shakespeare’s Most Important Book (Folger Shakespeare Library, 2011). Early modern Bibles were produced in many formats in this period, on a wide range of paper qualities. Donald Francis McKenzie, in a lengthy footnote appearing at the bottom of pages 28-29 in “Making Meaning, ‘Printers of the Mind’ and Other Essays” mentions that, “Cantrell Legge the Cambridge printer has left a very detailed ‘direction to value most Bookes by the charge of the Printer & Stationer, as paper was sould Anno Dni: 1622’ ” (Cambridge University Archives Mss 33.2.95 and 33.6.8) The book is available as an ebook through Google Play. Thank you for that very useful account! I usually use Robert Herrick’s “spice, or fish, or fire, or close-stools” (“To His Book”) when I try to explain to my students why we’re lucky to have ANYTHING on paper from this period.